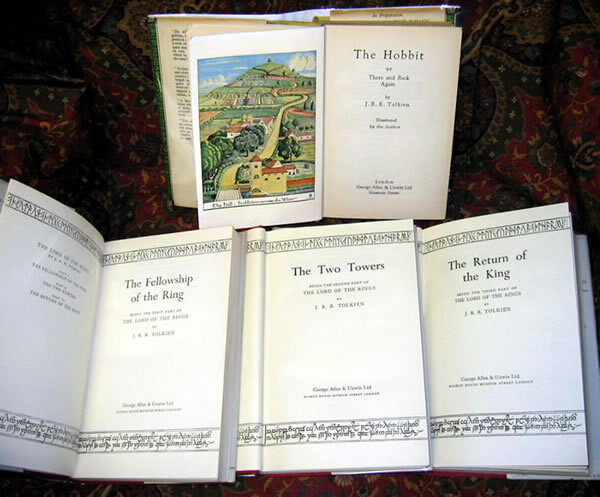 The Hobbit & Lord of the Rings UK 1954-1956 - $3250.00 George Allen & Unwin, 1954, 1955, & 1956 1st Editions plus a copy of the 1954 Hobbit, 6th overall printing, or the 2nd printing of the 2nd Edition (1951). 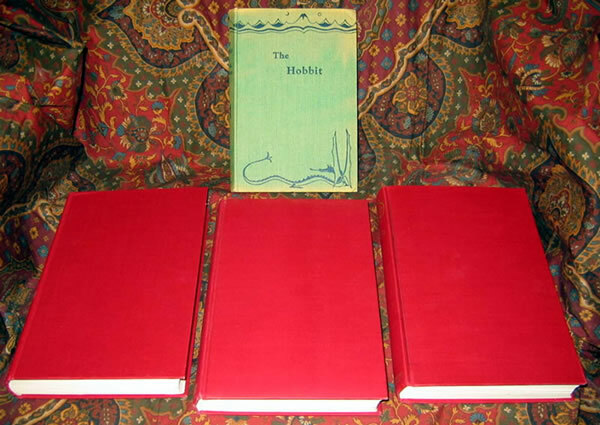 George Allen & Unwin, 1954, 1955, & 1956 1st Editions plus a copy of the 1954 Hobbit, 6th overall printing, or the 2nd printing of the 2nd Edition (1951). 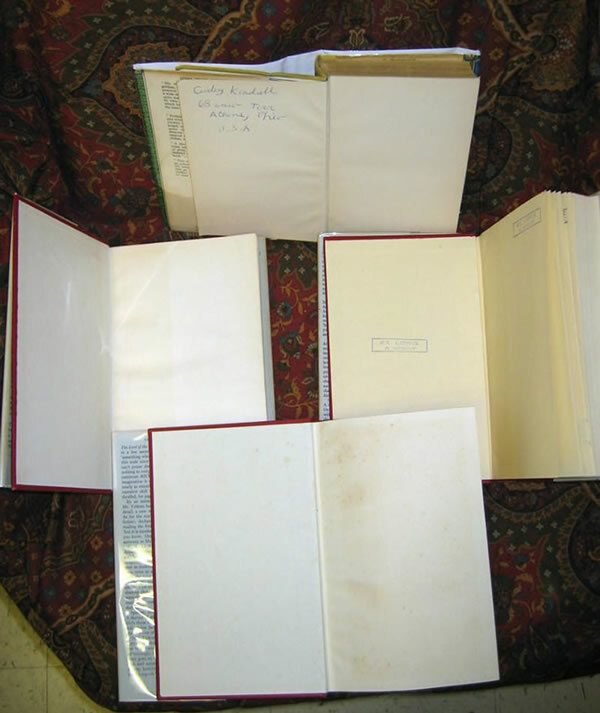 George Allen & Unwin, 1954, 1955, & 1956 1st Editions. 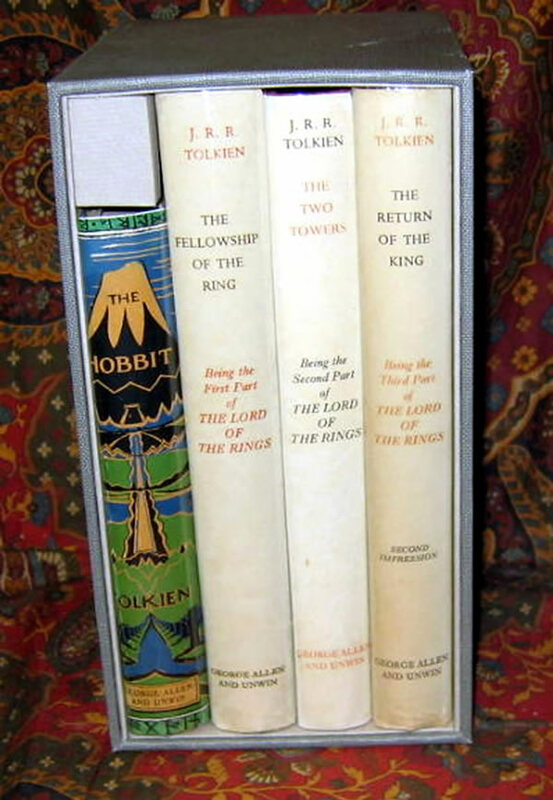 This 4 book set, housed in a custom cloth slipcase features a fantastic copy of an early printing of The Hobbit. The 1954, 6th overall printing, or the 2nd printing of the 2nd Edition (1951). 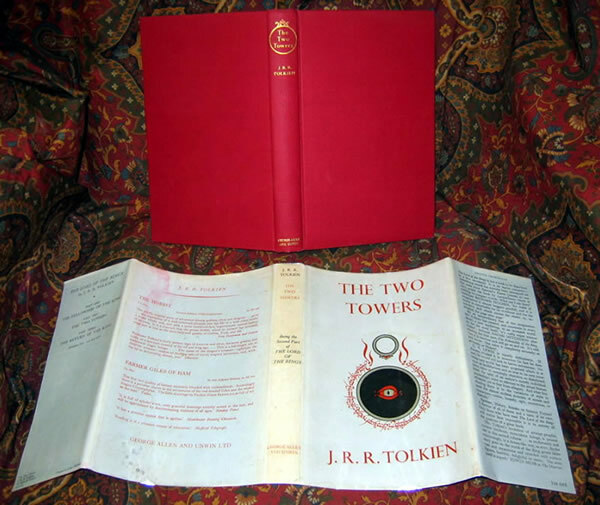 A Very Good Plus copy in like condition original dustjacket designed by Tolkien. 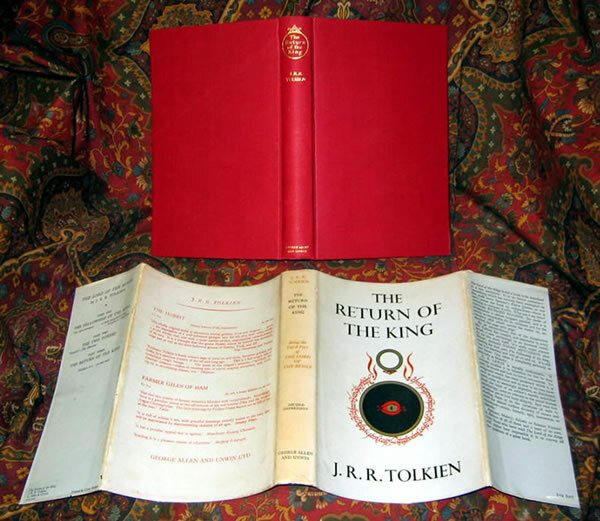 Stated 6th printing on front flap, price clipped, noted as printed in Great Britain, this is one of the two jackets that note "In Preparation" above "The Lord of the Rings" on the back flap. 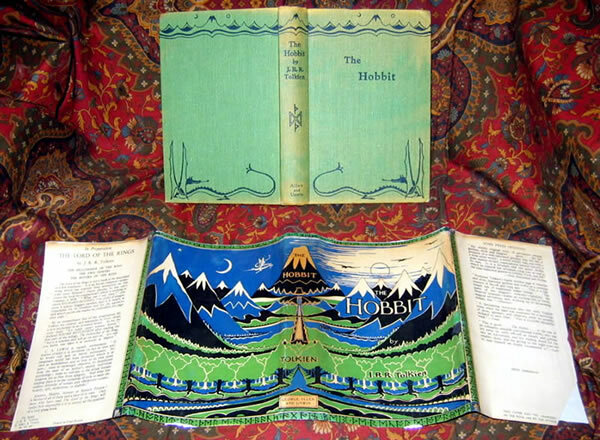 The text block is clean and bright, bound in the green original cloth from the publisher, with Tolkien's Mountains and Dragon design. Shows some fading to the green cloth, with very little shelf wear, slight rubbing at the folds, no soiling to note, or bumped corners. Contains the full color frontispiece "The Hill: Hobbiton-across-the Water", as well as the original line drawings by Tolkien. 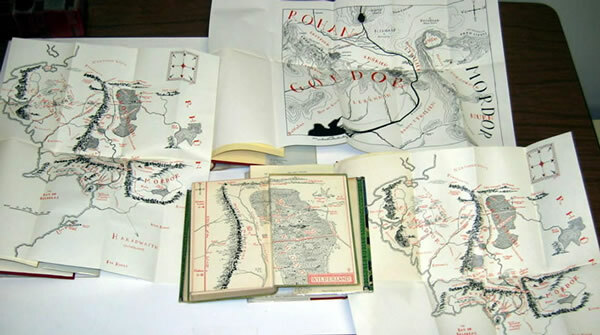 The maps are in excellent condition, red and black ink still show clear and bright against the unfoxed endpapers. A previous owners name on the back of the first blank page, without any other writing or marks. The dustjacket shows the smallest amount of restoration to the top and bottom of the spine. The jacket shows a light amount of soiling in the white sections, and the spine is lightly tanned. Overall a beautiful copy, scarce in original dustjacket in this condition. 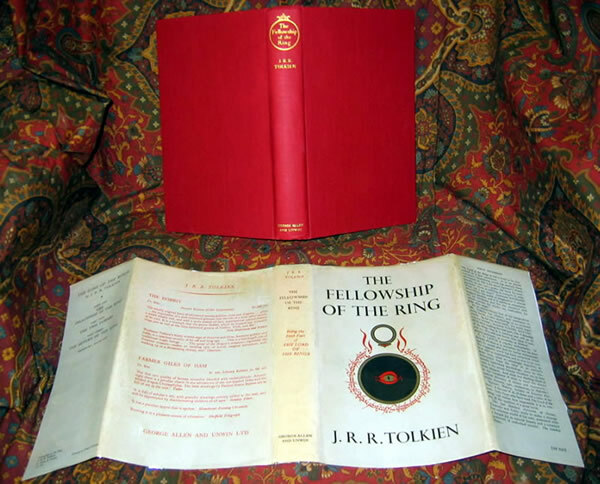 The Fellowship of the Ring, published in 1956, is in Very Good Plus condition. 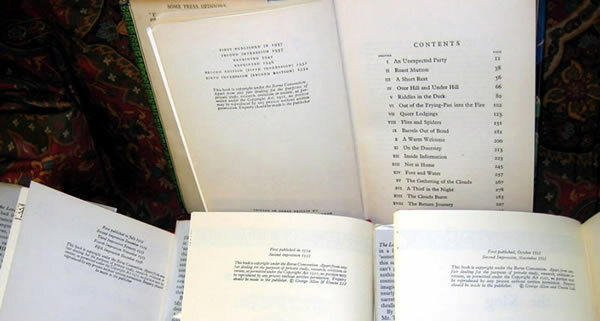 Stated 5th impression (is actually a 6th with printers error ommitting the 5th printing history) in its correct unclipped Near Fine 6th impression dustjacket with no loss or tanning. The gilt titles are bright with no tarnish. The cloth boards very clean, no foxing or offsetting, and with no names or inscriptions. The Two Towers published in 1955, is a Near Fine 3rd imp. (stated 2nd imp - printers error misidentifies 3rd as 2nd) in a Near Fine 2nd impression dustjacket, with no fading, no tanning, and is not price clipped. Gilt titles bright, with the boards very clean, only the lightest foxing, lacking any writing or inscriptions. The Return of the King published in1955, is a Near Fine 2nd Imp in a Near Fine dustjacket. The gilt remains very bright, the boards are immaculate, with some light offsetting, with a previous owners stamp (2) on the front endpapers. An exceptional set of these classics of fantasy literature. 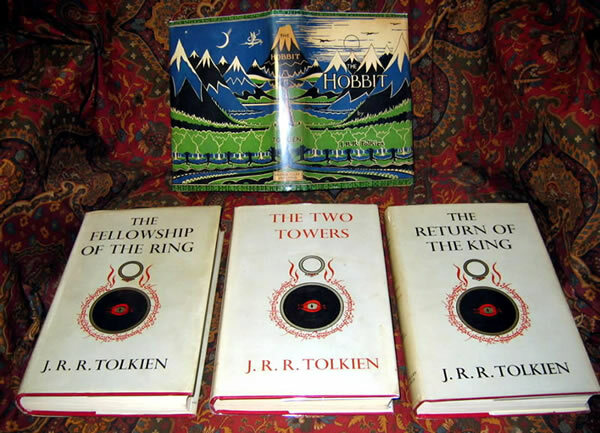 The set is all Near Fine to Very Good Plus, all unclipped (except the Hobbit), and virtually untanned dustjackets, (very unusual to be this clean and bright). Only slightest shelfware or bumped edges. Maps are all present, clean and bright, with no tears or extra folds. Further digital images can be supplied on request. 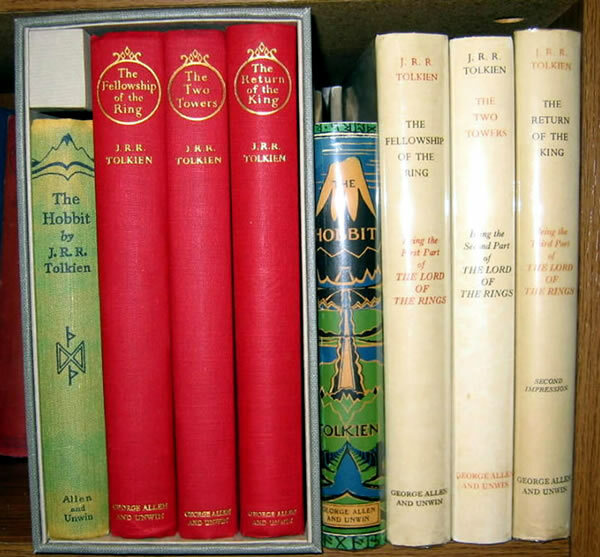 A beautiful, bright, contemporary set of Tolkien's fabulous classics, very scarce in this condition.